Like many, I am undecided about the role of advertising business models in free web software. The price is right, but is that all that matters? I like Gmail, but it bothers me to see targeted ads based on things I wrote in my non-public correspondence. I have never become addicted to wasting time on Facebook, using a page there mainly as a point of contact for distant friends and colleagues (and as a place to post an RSS feed for U.S. Food Policy). 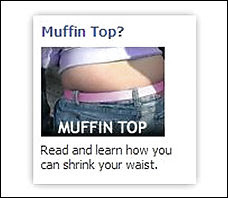 Facebook is good for those uses, but the ads there also seem crude and manipulative. Today, Rachel Beckman in the Washington Post puts the nail in the coffin. The lead sentence is, "My Facebook page called me fat." She describes targeted weight loss ads that prey on women's body image insecurities, based on demographic profile information known to Facebook from their participation in the social networking site.